Do you know your LGBT+ housing? It’s all very familiar for us. Every year, over a thousand people phone our advice line and ask for help about their housing. Many live in social housing. Most feel their voices are not heard. Isn’t it about time you did too? We provide consultancy, training and workshops to hundreds of organisations, services and housing providers, using the knowledge we’ve gathered from over 35 years of delivering services to lesbian, gay, bisexual and trans people. We recognise that every organisation has different needs, and different levels of knowledge about LGBT+ issues amongst its staff. We will work with you to design a training package that will enable your staff to actively listen, participate, absorb, practice and reflect on the information we provide. Our bespoke training package includes training on LGBT+ rough sleepers, improving your work with your LGBT+ customers, LGBT+ youth homelessness and many others. For more information, or to book a training session, contact us or download this brochure. We are currently developing an online learning programme. More details will follow, but please contact us if you would like to discuss your requirements in the meantime. 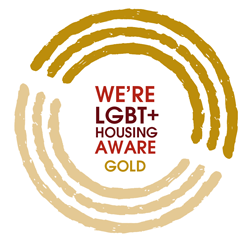 Our LGBT+ housing aware charter mark consists of three award levels: gold, silver and bronze. Organisations are invited to apply for charter mark accreditation. They will need to complete a pre-training questionnaire, a training programme and a post-training assessment six weeks after training. Organisations are then awarded the Charter Mark if they achieve all their award targets. For further information, contact Tina Wathern at Stonewall Housing.